Last year, we took a preliminary look at one of Summer 2014's early tentpoles--X-Men: Days of Future Past--and broke down some of its keys to contending for the 2014 domestic summer box office crown. Thanks to your enthusiastic responses toward that original story, we think it's only fair to highlight the season's other contenders in what looks to be the first summer in years with more than one or two legitimate front-runners. 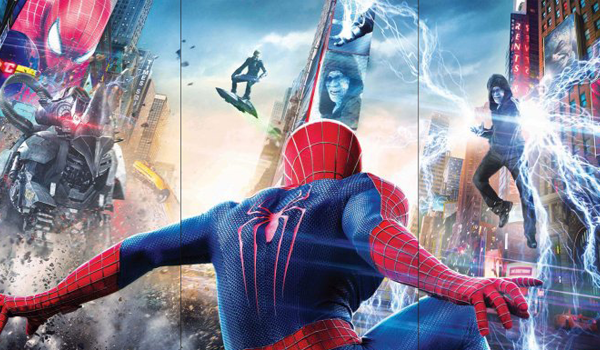 Thus, Part Two of this "5 Reasons..." series looks at the potential of another fan favorite: The Amazing Spider-Man 2. It's no secret that Sony has big plans for their new iteration of the popular series. Sam Raimi's trilogy delivered some of the biggest box office numbers in history between 2002 and 2007, while 2012's reboot was a global success in its own right. Now, which elements could inspire major blockbuster status for director Marc Webb's second foray into web-slinging territory? Considered by Hollywood as the official start to the season, the first weekend of May has delivered the eventual summer box office victor for the past two years (The Avengers and Iron Man 3). Believe it or not, that's far from the norm. Prior to 2012, only two movies had ever won a summer after opening on that weekend: 2007's Spider-Man 3 and 2002's original Spider-Man. Incredible amounts of audience goodwill were on the side of the franchise at the time, but competing comic book franchises may have somewhat diluted Spidey's "event" status in recent years. That being said, playing through what is typically summer's least competitive period (early May) gives it an edge that no other movie will have this year. Sony may want to watch out for Godzilla in week three, though. Among the biggest driving forces throughout the first four Spider-Man big screen adventures, as with most comic book properties, were kids and families. This franchise especially boasts an advantage over others with the character still considered by many as the most popular among young males--which just happens to be one of the most crucial demographics to corner in any summer. Although Spider-Man's comic sales fell to #2 (behind Batman) last year for the first time since before the first Raimi flick, it still remains a hot property. Appealing to all ages was equally as important to the phenomenal success of the franchise's early editions, but we often see that kids are the ones deciding which movie to drag their parents to see. The humor and flashy visuals of Amazing Spider-Man 2 should make that a reality once again. The question is: how much will everyone else come back for another helping of Spider-Man? #3) The Rogues Gallery / "Anti-Avengers"
Without delving too far into spoiler territory, The Amazing Spider-Man 2 promises to throw multiple arch-nemeses into Peter Parker's path. Spider-Man's catalog of villains is widely regarded as the richest of all comic book properties (although, Batman's also has a strong and vocal following). Tying into our previous reason, that's major fodder for reeling in younger crowds. The biggest question mark here is how well the creative team can pull off such a challenging narrative goal. Films like Batman & Robin and Spider-Man 3 notoriously killed their franchises' momentum, in part, due to an over-reliance on flashy villains not given enough time for character development. If Sony, Webb, and the entire team have risen to the challenge, the seemingly villain-heavy sequel could be viewed as the antithesis to The Avengers. Ultimately though, Peter Parker/Spider-Man is the star. This may be the most hotly debated point on our list. Audience goodwill typically pays off for sequels when their predecessor was very well-liked. 2012's reboot wasn't as gloriously heralded as the likes of The Dark Knight or The Avengers, but it does have its share of fans and is generally considered an improvement upon Spider-Man 3. Unfortunately, its box office legs were cut off by one of 2012's biggest event pictures, The Dark Knight Rises, when it released just 17 days after Spidey's origin story redo. In fact, the nature of Amazing Spider-Man 2's exploration into new storylines could theoretically help bring back some of the general audiences its predecessor lost. Word of mouth will decide whether or not that scenario pans out. Historically, Spider-Man movies have been a safe bet for blockbuster stature. Raimi's first and third films were the top domestic earners of 2002 and 2007 with $404 million and $337 million, respectively. 2004's middle chapter ($374 million) barely missed out on becoming that summer's top dog as it trailed only the juggernaut phenom that was Shrek 2 ($441 million). Now, 2014 presents an interesting scenario: for the first time since 2007, there are arguably more than one or two front-runners to "win" the summer. Even 2007 itself was narrowed down to three candidates (Spider-Man 3, Shrek the Third, and Pirates of the Caribbean: At World's End) by most of the industry far in advance. Transformers became a surprise blockbuster and gave the aforementioned three a run for their money when they each failed to live up to audience hype. With a record opening not likely in Amazing Spider-Man 2's future, there will be no massive jump out the gate to create an insurmountable total for other flicks (something that recently benefited summer victors like Iron Man 3, Harry Potter and the Deathly Hallows Part 2, Transformers: Revenge of the Fallen, and Spider-Man 3--all of which pulled record or near-record debuts). Translation: The Amazing Spider-Man 2 will need to prove itself as an event for regular moviegoers after opening weekend. The Summer 2014 crown might be (by default) Spider-Man's to lose, but as a franchise without significant blockbuster momentum itself, we can easily argue that its balance of pros and cons make it as much a wild card as the other contenders. Speaking of those other contenders, we'll cover the remainder of them in the weeks ahead as summer draws near and studios begin ramping up their marketing machines. Stay tuned.